Cloud Go Health: What is Morton's Neuroma? Morton’s Neuroma is a condition characterized by a pain or numbness to the bottom of one’s foot, that may be exacerbated with tight fitting shoes or prolonged weight bearing. The pain is often located on the ball of the foot either between the 2nd and 3rd toes or the 3rd and 4th toes. 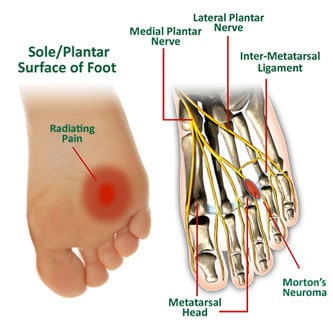 While the term neuroma indicates a tumour or growth, Morton’s neuroma is associated with nerve entrapment due to a fibrous overgrowth, caused by repetitive irritation and inflammation of the sheath around the nerve. Initial treatment looks to help reduce pain and inflammation through activity modification and ice therapy as well as the use of other modalities such as ultrasound, transcutaneous electrical nerve stimulation (TENS) and soft tissue massage depending on the presentation. Sometimes footwear modification or taping techniques can be used to help offload the painful area. After initial symptom management, a physiotherapist can help with guidance on stretching, soft tissue massage, and joint mobilization to help restore normal toe and foot mobility. From there it is important to address the underlying cause of the neuroma and work on correcting alignment and intrinsic foot strength. Send us an email at office@activelifephysio.ca if you have any questions or a topic that you would like to see on our blog.